Workshops, Parties, Group Events & Fundraising Click Here! Thanks for thinking BIG & shopping SMALL! 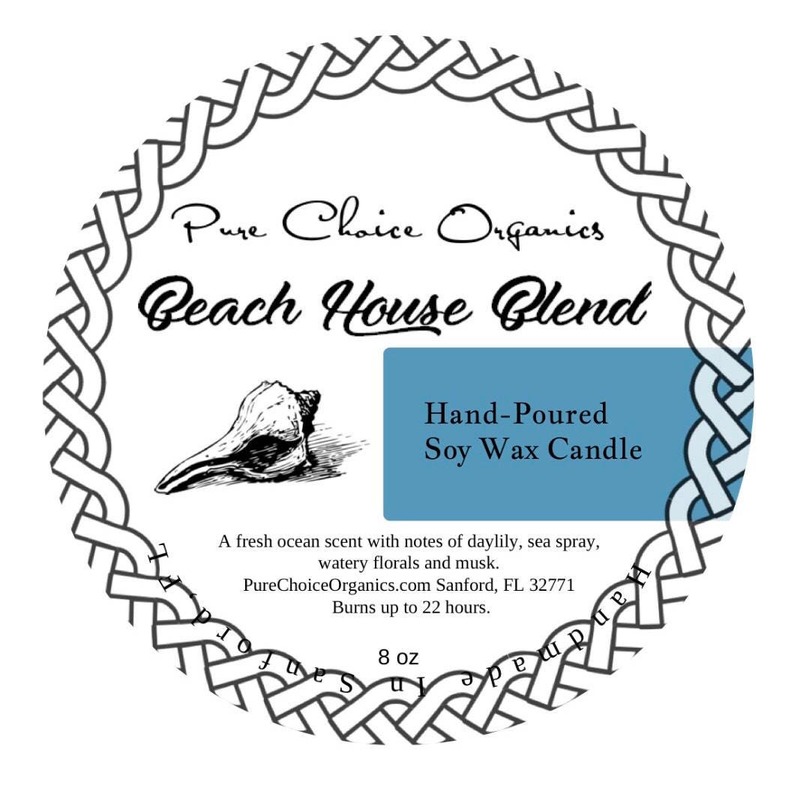 Beach House Blend Soy Wax Candle is like a breeze off the ocean that's going to make you wish you were there. As shown above, our glass candle has a modern feel with attractive, bright packaging featuring our signature air tight chrome lid. Perfect for home or away. Burns for between 22+ hours releasing a fabulous fragrance. 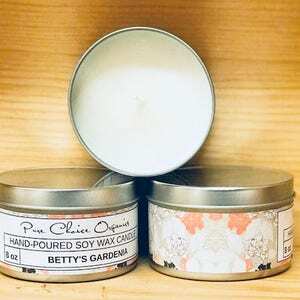 Our Candles are made in a reusable 8 oz. glass jar with chrome lid. We use quality fragrances/essential oils to make sure you get a great smell all the way through to the end of your candle. Be sure to check out our great customer reviews below. When lighting the candle for the first time allow it to burn so the the wax melts right to the edge of the tin ~ we recommend four hours and this will help avoid tunnelling and the candle will last longer. We recommend trimming the wick to 1/4 inch before each burn. Keep the candle clear from any foreign materials and burn on a level, fire resistant surface away from drafts, vibrations, children and pets. Please be aware that the tin can get very hot when the candle is burning and should not be moved. If you notice anything unusual about the way your candle is burning, extinguish it immediately. Only Paypal and Direct Checkout through Etsy are accepted. If you pay with an E-check through Paypal, please note that your order will not ship until the check clears, usually in 7-10 business days. International customers: Duties and taxes are the responsibility of the buyer, I will not mark merchandise as a gift, this is highly illegal. Please see listing description for exact shipping rates, method & times. Items vary according to how long it takes to prepare and cure each specific item. We package all of our items with the utmost care to assure we do everything we can to give them a safe journey to your home. But, we have no control over how they are treated once they leave my hands. All items are shipped USPS either First Class Mail or Priority Mail. All methods will have tracking numbers emailed to you once I print your shipping label. USPS provides insurance up to $100.00 for all packages for FREE! Due to the nature of my products we do not offer refunds or exchanges. If an item is received damaged or is incorrect, please contact Customer Support immediately at (407)906-SOAP or Hello@PureChoiceOrganics.com and have your order information ready, because we're going to fix things up in lightening speed. If your merchandise is damaged or incorrect upon arrival, save all contents and packing materials and contact us within 3 business days after its arrival. Shipments that arrive in damaged condition will be replaced only after the damaged merchandise has been returned to Pure Choice Organics (within 10 days of delivery) for inspection. Shipments that have been determined to be lost, after thoroughly researching the package through Delivery Confirmation tracking, will be replaced. For both circumstances, a monetary refund will not be given. Interested in Carrying Pure Choice Organics? Already carry Pure Choice Organics ? •You must complete a wholesale account application, providing your EIN, and Sales & Use Tax ID. •While there are currently no MOQs, products must be bought by the case. •Your store must meet the standards of the Pure Choice Organics brand and not dilute the image we promise to uphold for our wholesale family. Accounts will be reviewed annually. We reserves the right to cancel an account if Pure Choice Organics goods are not being well maintained, stocked in suitable temperatures, displayed well, kept in good hygiene (sample/tester products replaced as needed) or if the account changes ownership. Duplication or adulteration of products or packaging or falsely representing products as your own is strictly prohibited. Pure Choice Organics, LLC does not allow our products to be sold on any type of auction site. We reserve the right to limit or discontinue the selling of our products to parties with sales and distribution strategies not compatible to those of Pure Choice Organics. Fulfillment can take up to 4-6 weeks depending upon stock levels, and therefore all wholesale clients are asked to plan accordingly. If all products in your order are in stock and ready, you should receive your order within 2-3 weeks unless expedited shipping is selected. Back-ordered items can take up to 8-10 weeks to arrive. Please specify if you would like items to be sent as they are ready or held until the order is able to be shipped in full. Additional shipping fees may apply. The shipping charges quoted in your order are based on the total weight of the products chosen via USPS Priority Mail. All orders will have Delivery Confirmation added. Orders shipped via USPS Priority Mail will require mandatory insurance based on the wholesale value of the order. UPS Ground Service shipments valued in excess of $100 will require additional mandatory insurance up to the wholesale value of the order. If you would like expedited shipping, please notify us when you place your order. If you would like us to use your shipping account, please include all necessary acct info on the shipping page. Our orders are fulfilled on an automated system and therefore we are unable to edit them once they have been placed, so please be sure to review your shipping selection before placing your order. Insurance is required on all international orders (when available). If your particular country does not enable the purchase of insurance on your package, Pure Choice Organics will not be responsible for any loss or damage that may occur. Pure Choice Organics reserves the right to refuse any order felt to be fraudulent. Orders must be paid for in full in U.S. currency prior to shipment. At this time, we do not offer Net 30. 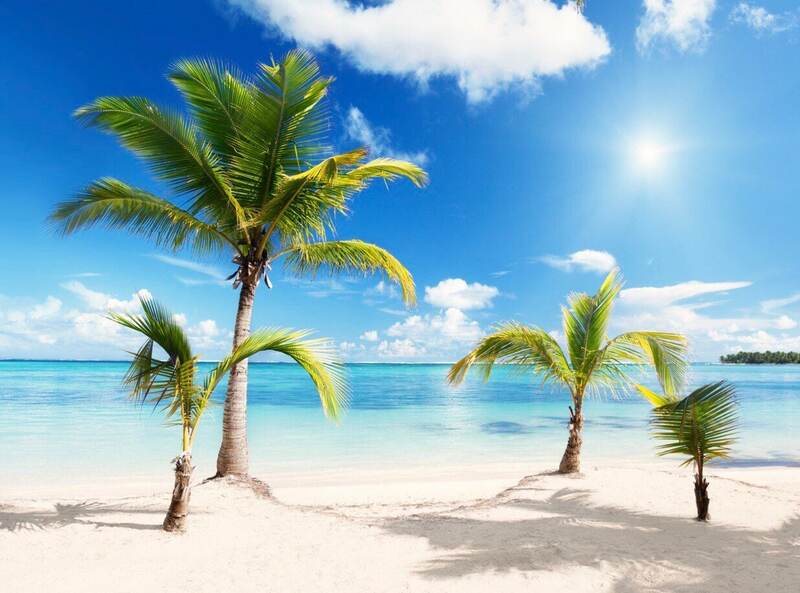 We accept Visa, Mastercard, checks (with a 10 day hold for processing), cashier’s checks, and US money orders. Returned checks due to insufficient funds will be charged a $25 fee. Credit Card charges will appear on your statement as Pure Choice Organics, LLC. International orders must be paid by wire transfer or US money order and must arrive in US Currency. Any fees associated with the money transfer must be covered in the amount sent. If you are an international client and need to speak with us about other options, please contact hello@PureChoiceOrganics.com. We stand behind our products and want to maintain a great relationship with our retailers. After all, you’re family. All retail orders come with a 30 day money back guarantee. Items must be in resalable condition. Simply return the merchandise with the original invoice and a note stating your reason for return and we’ll gladly refund your purchase price. Shipping & handling charges are not refundable, and a 15% re-stocking fee will be deducted from the re-fund. If your merchandise is damaged or incorrect upon arrival, save all contents and packing materials and contact us within 3 business days after its arrival. Shipments that arrive in damaged condition will be replaced only after the damaged merchandise has been returned to Pure Choice Organics within 10 days of receipt for inspection. Shipments that have been determined to be lost, after thoroughly researching the package through Delivery Confirmation tracking, will be replaced. For both circumstances, a monetary refund will not be given. Due to our size and efficient fulfillment, we move pretty quickly, so we cannot guarantee that your order can be cancelled or altered after it has been placed. You may contact us as soon as possible to see if your order has already started to be processed. In the event that it has not, we will be more than happy to make changes to it within 24 hours. All discounts must be applied when you place your order. Once the order is placed, we cannot offer a refund. Sign up for our newsletter and follow us on Facebook and Twitter to find out about promotions and receive special discounts. Due to the nature of our products, we do not provide sample products. Providing tester products to the public is up to the retailer’s discretion. In an effort to help increase your sales, we offer the ability to purchase tester bars at 25% off wholesale. If you would like to have more than 1 additional tester per case ordered, please account for this in the quantities you order. It is the your responsibility to maintain a clean environment and replace tester products as needed. Failure to maintain a clean display and products can result in termination of the your wholesale account. We hate spam as much as you do, and will never share your information with anyone. It is for our eyes only. Subscription to our newsletter is not automatic and must be registered for by you. The only automatic subscription is for our resellers who will be added to a reseller list to be notified of any important changes in policies, line sheets updates, and things of similar important nature that directly effect your account and sales. Sensitive information entered online is encrypted and transmitted using Secure Socket Layers. Our site carries a Premium SSL Secure Site seal and we take every opportunity to add additional security features. The MAP policy applies to all Pure Choice Organics products. Our minimum advertised price for Pure Choice Organics products is 85% of the Suggested Retail Price (SRP), which is a 15% discount off of SRP. 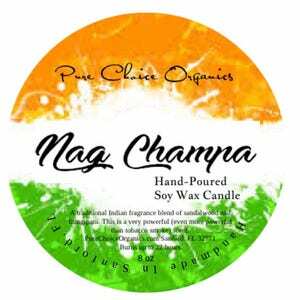 Resellers may offer products on promotion at a lower advertised discount only with written permission from Pure Choice Organics, LLC. The MAP policy may be adjusted by Pure Choice Organics at its sole discretion. The MAP policy applies only to advertised prices and does not apply to the price at which the products are actually sold or offered for sale to an individual customer within the reseller’s retail location or over the phone. Pure Choice Organics resellers are free to sell MAP products at any price they choose. This MAP policy does not in any way limit the ability of any dealer to advertise generic phrases such as that they “have the lowest prices” or “will meet or beat any competitor’s prices,” or similar phrases so long as the price advertised or listed is not below the MAP. To protect our resellers from unfair competition and to maintain the brand’s image, Pure Choice Organics will regularly review all reseller commerce sites and conduct in-depth web searches to ensure consistent adherence to this policy. In cases of violation of this MAP policy, resellers will be allowed 24 hours to bring all advertising into compliance. Warnings and written notices will not be provided. Failure to comply immediately will result in discontinued shipments and possible account termination. Pure Choice Organics reserves the right to cancel or limit the sale of its products to parties whose sales and distribution strategies are incompatible with those of Pure Choice Organics. The sale or distribution of Pure Choice Organics products outside the United States or to a third party other than an end consumer is strictly prohibited unless specifically approved in writing by Pure Choice Organics. Pure Choice Organics reserves the right to cancel or limit the sale of its products to parties whose sales and distribution strategies are incompatible with those of Pure Choice Organics. Resellers must have privacy and customer service policies, as well as overall business ethics that are compatible with those of Pure Choice Organics. It is crucial that the Pure Choice Organics family remain a reputable and trusted brand. All internet resellers must have a web address of their own to sell Pure Choice Organics products. You may not use a subdirectory of another company’s URL, such as an Amazon.com storefront. Additionally, you cannot sell products through any online auction site such as eBay. Pure Choice Organics products should be represented as part of a category of like products, and should make up only a portion of the offerings sold online by the web retailer. Once approved, we will send product photography free of charge for use on your website in order to maintain a consistent presentation of the brand. All Pure Choice Organics material, including text from our website, ads, catalog, and other written documentation, may be used only with the express written consent of Pure Choice Organics, LLC. The presentation of the Pure Choice Organics line on your site must clearly differentiate from Pure Choice Organics company websites and must not confuse a “reasonable consumer”. Pure Choice Organics will review your website prior to setting up an account and reserves the right to refuse sales at its discretion. Pure Choice Organics will also review your site periodically to ensure ongoing compliance with this policy. 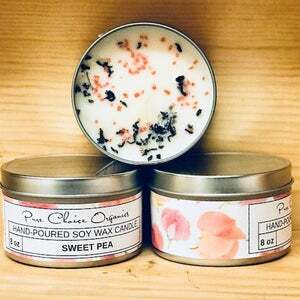 By placing a wholesale order, you are stating that you understand and adhere to all policies set forth by Pure Choice Organics, LLC. 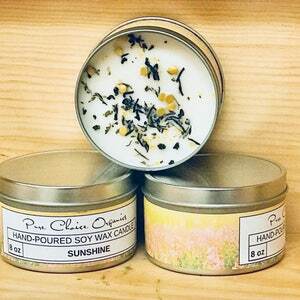 Pure Choice Organics is an approved Etsy wholesale vendor. We are partnered with some of the finest stockists and retailers across the country and internationally. Please contact us for more information if your store would like to join the Pure Choice Organics family! Would you like your order gift wrapped? We can do that for you for just $5. Our orders are wrapped and shipped as tightly as we can to prevent breakage, but in case the mailman was playing kickball with your candle, we also insure all packages. 2- photo of the package as you received it. Try to include inner packaging. We will have a replacement product out to you immediately and will file an insurance claim with the carrier.